This is a natural plush material, which is used traditionally for making Teddy Bears. “Mohair”, which means “fabric made of goat hairs”, descends from the hairs of the Angora goat. Mohair is very hard wearing. Its silky brightness makes mohair one of the most valuable fibers that nature has to offer. This is a very rare and a most valuable natural plush material, which is also used for making very special artist Bears. The Alpacca fibers descend from the hair of the Alpacca animal. Because there are only a very small number of these animals remaining in the world, this natural fabric is traded only at the highest prices. This is a man made plush material, which was developed in the Thirties. Artificial silk was used for making Teddy Bears especially in the Forties and Fifties. Because this original artificial silk material can no longer be made because of technical reasons, Teddy Bears made of artificial silk enjoy the highest response. This is a fabric material, which is traditionally used for making the Teddy Bear’s paws. This is a natural material, which is traditionally used to fill Teddy Bears. Excelsior is a very fine kind of wood wool made of pine-wood. Special old and traditional tools are needed to stuff a Teddy Bear with excelsior. To stuff Teddy Bears with excelsior is a very old craft and difficult to learn. It needs much more time to fill a Teddy Bear with excelsior than to fill it with other material. Therefore excelsior stuffed Teddy Bears are very valuable. Today, only a handful of very traditional old manufacturers are still able to stuff Teddy Bears with excelsior. 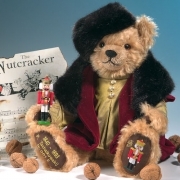 Because of their rarity excelsior stuffed Teddy Bears are particularly requested by collectors. This is a natural material, which is used in former times to stuff soft Teddy Bears. The Kapok fibers descends from the fruit of the tropical Kapok tree. Today Kapok is no longer used to stuff Teddy Bears. This is a natural material, which is used in former times to stuff soft Teddy Bears. Today sheep’s wool is only used sporadically to stuff very high quality collectible Teddy Bears.Foam rubberThis was the first ever used synthetic filling material for Teddy Bears. Mainly it was used in the Seventies, to make Teddy Bears washable. In addition foam rubber flocks have a special importance as filling material, because they could be manufactured with a stuffing machine. Today foam rubber flocks are no longer used as a filling material for Teddy Bears. This is a very soft synthetic high quality filling material for Teddy Bears. It can be manufactured by hand or machine. Today polyester fibers is the most common filling material for today’s Teddy Bears. This is a modern filling material for Teddy Bears, which is mainly used for some special artist Bears. These are black, not glossy Teddy Bear eyes, which are made of old shoe buttons. Shoe button eyes were used for the first generation of Teddy Bears. Today original old shoe button eyes are not longer available for Teddy Bear production. These are hand made Teddy Bear eyes made of glass material, which are traditionally used. They must be drawn into the Bear’s head by handwork. Because glass eyes do not conform with the European safety standards for toys, glass eyes are only used sporadically for very high valuable collectible Teddy Bears. These are eyes made of plastic material, which can be riveted into the head of a Teddy Bear. Because of the European safety standards, safety eyes are predominantly used for the production Teddy Bear today. This is a special voice box, which is traditionally built into the Teddy Bear’s body. Because the voice box has a fixed size, only Teddy Bears with a size of 30 cm respective 12 inches and more can get a growler voice. Because the voice sounds especially clear in an excelsior stuffed Teddy Bears, all excelsior stuffed Teddy Bears get a growler voice. The growler voice works if the Teddy Bear is moved forward and back by turning the head up and down. In addition to growlers there are also music voices and others, which can be built into a traditional Teddy Bear, so that the Bear can make a variety sounds.